Lindsay Transportation Solutions is the manufacturer of The Road Zipper System® and the world leader in moveable barrier technology. The Road Zipper is used to create additional highway capacity, relieve traffic congestion, and provide positive barrier separation between opposing lanes of traffic. For managed lanes, the Road Zipper reconfigures the roadway in real time to add more lanes to the peak direction, while eliminating crossover head-on accidents. LTS is a proponent of “flexible highways,” where the design process is focused on providing the greatest amount of future flexibility. This includes design concepts that limit or eliminate center structures, so that multiple lines of moveable barrier can quickly reconfigure the highway throughout the day in response to the real-time demands of peak traffic. To learn more about these concepts, join hosts Chris Sanders from LTS and Gary Gallegos, formerly of SANDAG, in a forum titled, “Innovative Solutions and Applications for Traffic Congestion” at 1:45 pm on Thursday, November 8th. For construction, the Road Zipper is used to accelerate the construction process, mitigate traffic congestion, and provide the safety of positive barrier protection between workers and motorists. The Road Zipper saves time and money by allowing agencies to combine or eliminate construction stages, which accelerates the construction process by up to one full season. During partial closures, the barrier manages traffic flow to significantly reduce user delay costs. 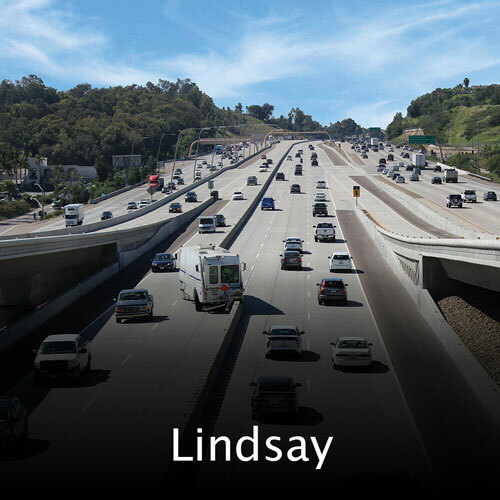 Lindsay Transportation Solutions is also recognized as a global leader in the manufacture and supply of crash cushions, end terminals, TMAs, steel barriers, and portable barriers.